I have a love/hate relationship with my skin. Some days I will wake up, and it'll be fine. Other times, it'll take one glance in the mirror, and I'll want to immediately climb back beneath the covers. Unfortunately, on such days, this is not always possible. So here are a few products that I use to keep my unpredictable skin in line.. and do the best I can to ensure every day is a good-skin-day! First up, something I've only recently picked up.. the Clinique Dramatically Different Moisturising Gel. I honestly don't know why I didn't pick this up earlier. A good moisturiser was something that I was really lacking in my skincare routine. I'd pop on my Effaclar duo [+], slap on some suncream, and go about my day as usual, then be faced with unhappy oily skin by the end of it. My skin was oily because it needed more moisture.. and I cannot stress how much of a valuable lesson this is to learn. For absolutely ages I had bypassed this idea as 'something that wouldn't work for my skin,' I'd been scared to use moisturisers for the fear that my skin would react badly from the extra moisture, but I can happily say that by adding this product into my daily routine, not only is my skin less oily, but much softer as well. A definite win-win. Next.. something that I had dismissed from my skincare routine for almost a year. I'm sorry, Liz Earle Cleanse and Polish! I had originally thought that this product had been the cause of my bad breakouts last winter, but it turns out my skin just really disagrees with the colder weather, as the same thing has happened this year. So, I welcome this product back with open arms. The smell is wonderful, and the results are pretty great too. I use this alongside my Emma Hardie Cleansing Balm still, of course! And how could I possibly write a post like this and not include my favourite Effaclar Duo [+]??! I've recently tried out the entire Effaclar 3-Step Anti-Blemish System*, and wow! A truly wonderful set of products. The toner is a definitely a brilliant addition to the range, as this year I have really come to love liquid chemical exfoliants, and this one complete with witch hazel, lactic acid and salicylic acid works so well with my skin. I love the ease of just popping some onto a cotton wool pad and sweeping it across my face. A really refreshing way to apply a product, and it's a real bonus that it actually makes a noticeable difference as well! Staying on the topic of chemical exfoliants.. I really have become somewhat obsessed with them this year. I may have gone slightly overboard in September/October, as my skin went from looking smooth and perfect, to a little irritated and sad in a matter of weeks, due to me using them on a daily basis. Definitely use these in moderation!! 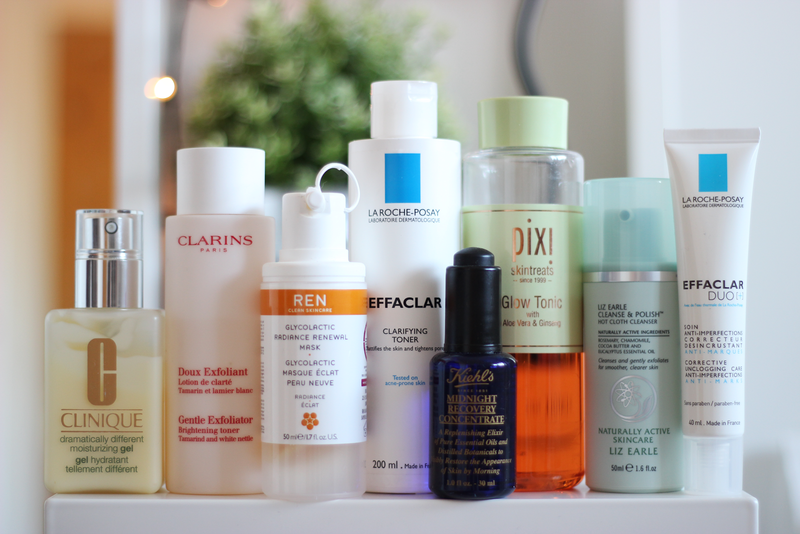 My top picks would be the Pixi Glow Tonic, and Clarins Gentle Exfoliator, as well as REN Glycolactic Radiance Renewal mask for particularly congested days, or weeks when I have been slack with my exfoliation. Especially great to use before a big event to ensure a smooth base to work on for make up! And last, but not at all least, the lovely Kiehl's Midnight Recovery Concentrate. I pop a few drops of this into my palm and massage it over my face before bed. It calms down any irritation, and gives a little kick of hydration without feeling greasy. A little bit of luxury. I really hope some of you find this post helpful, and good luck on your journey to problem free skin! Remember that the food you eat, sleep, hormone imbalances and your surroundings can all also play a part in how your skin looks, so the key is to take everything into consideration and keep stress levels low. So many lovely products in one simple post! I need to add a few in my collection, specially the Clinique Moisturizing Gel and the Kiehl's midnight recovery! I am currently trying effaclar duo and it is breaking me out terribly (I used it for almost 2 wwks now), I was wondering if you also experienced the "initial" breakout period due to it purging action before the enhancement or not? Hi, I'm not Amy but I also experienced this purging phase while I was trying out the duo +. I did a review on it if you're interested in more info on what happened during my trial of the product. It didn't work for me personally, but I know a lot of people have had good results with it. Thank you for your reply I appreciate. I'll check your website. Hey! I did experience a little bit of a breakout when I very first started using it just over a year ago, but after a couple of weeks I really began to see a difference. I think perseverance is key with this product, as the active ingredients aren't there in huge quantities, and it's an 'all over' facial treatment rather than a spot treatment, so the results will be a little slower than usual. However, it's so useful because it's such a gentle product, so you can't really overdo it! I'm on my 8th/9th tube of the stuff now, and although I have cut down my usage, I always like to have a tube on hand for when my skin looks too congested, and within a couple of days it starts looking a lot better. Great post - my skin has been acting up a lot lately so thanks for some really good tips!